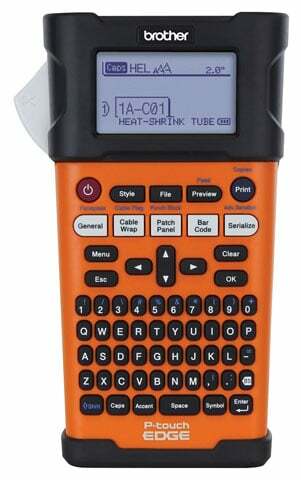 Designed by industry professionals for industry professionals, the PT-E300 is the first of a new generation of the P-touch EDGE family of industrial handheld labeling tools, created to help inspire labeling. Brother started from the drawing board so the PT-E300 is built right the first time for the contractor or IT professional. Brother paid close attention to details and developed smart and intuitive features that will help the PT-E300 conform to work flow processes for virtually any size job. The most outstanding feature is that the PT-E300 is designed to be just picked up, press a few keys and then print the right looking label. Brother helps you master using the PT-E300 virtually without reading a manual or going through a learning curve. Smart label application keys help you navigate and input a few simple layout parameters for each labeling application to custom fit almost any size cable/fiber/wire, faceplate, patch panel, punch block or other industrial applications. The PT-E300 has smart font sizing technology that prints high quality, clearly formed characters automatically selected to fit on the right label size. This feature helps contractors conform to the short and long ANSI/EIA/TIA-606 identifier format.